Best Home Furnishings, Green Home Furnishings, Fashion Home Furnishings: How to Furnish a Beautiful Hallway? How to Furnish a Beautiful Hallway? Hallway is an area at the door entrance, which is not designed to produce convenience to the guests to take off clothing as well as change shoes and hang hats, more importantly, it is the first scenery people seen before entered the room, though it is small in size, but play an extremely important role to the style of the whole room. And the most effective way to beautify the hallway is to decorate it with furniture and home decorations. At first, the design of the vestibule should be based on the room type and home decorating style, it could be made into arc-shaped, strip shaped as well as rectangular shape, and material scope can contained wood, glass, stainless steel, stone and so on. Generally the hallway made of stainless steel and glass materials are more closely tied to the simple modern style home furnishings, while hallways made of stone material and wooden boards will more suited to countryside style home furnishings. 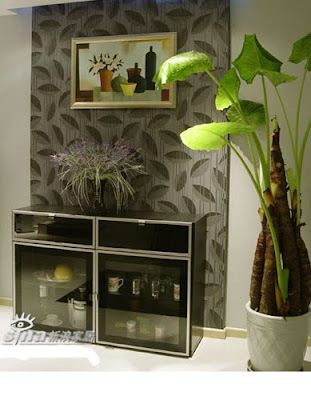 As regard to home furnishings and home decoration, small tables are very suitable to place in a hallway, whose desktop is not need wide, and can stand lean to the wall, above which, to hang a mirror or a selected painting, plus matched with a pair of decorative wall lamps, the effect is be quite good. If the hallway area is large enough, an arc-shaped wall table will be a good choice, which will even bring your home more luxurious temperament. If you pay more attention to the practical function of the hallway, the simplest way is to display a group of vertical clothes hangers, and there are many novel design clothes hangers are takes up much less space, but also can provide some storage space for things, with them you can store each pieces of things at the door entrance and incorporate them altogether; another choice is to place a big size oblique triangle or converted trapezoidal shaped cabinet in it, which can store a lot of things and at the same time seemed small and exquisite. As respect to home decorations, you can use fabric furnishings, lighting and green plants to decorate. You can place an exotic printed cloth or an antique desk flag on the wall or tabletop. Lightings as small spotlights, tube-shaped lights, strip lights, wall lamps, neon lights and other items of lightings can irradiate the hallway very bright, at the same time make the environmental space looked more elegant. If the vestibule size is not much large, you should notice not use too much lightings in it, and two or three pieces is appropriate. Make use of the wall face and countertop behind the door, put several potted foliage plants, for example, chrysanthemums, primrose, etc., which can bring the hallway a bit of vitality, but should noticed that the placed plants should not hinder sights of guests as well as not impede the access. * Original post: How to Furnish a Beautiful Hallway?